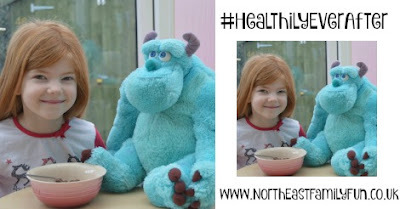 We love Disney in our household and Disney movies have been an integral part of both my own and my children's childhood so it was pretty easy for us to get involved and join in with #HealthilyEverAfter. After a family discussion I was surprised at just how many of the Disney characters inspired us to stay healthy. 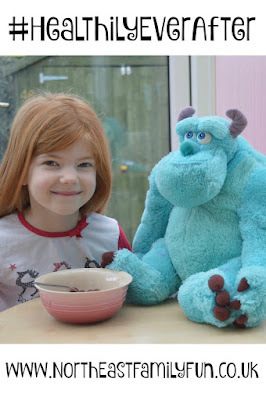 We chatted about how we like to swim underwater like Ariel, how we can dance like Princess Aurora and how we take part in Monster Olympics just like Sulley and Mike. In fact it's easy to include any of your children's favourite character in encouraging a healthier lifestyle with a little creativity. Sometimes it's a real struggle ensuring that my children eat all of their breakfast (especially on a school day when time is of the essence). 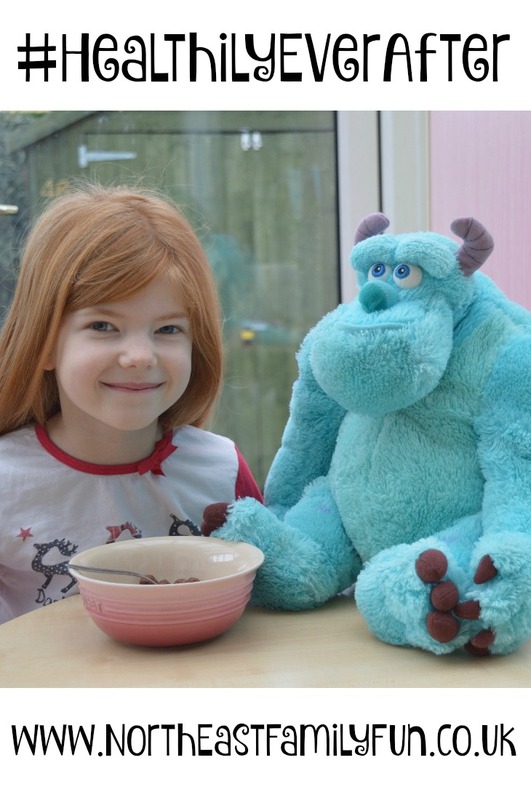 We decided to make the meal a lot more fun by adding our favourite Disney soft toy to the table and letting him join in too. Everyone wants to grow up to be big and strong like Sulley. The kids loved this simple idea and breakfast time was suddenly fun again. They cleaned their bowls without any fuss. When we are out and about at the weekend we will usually stop at a tearoom for cake or even worse - a pub for lunch! We made a change this week and packed our bag with bananas for our weekend walk. Before the children could moan, we explained that it was all part of a game and we all pretended to act like King Louie from The Jungle Book. The kids were delighted when mum and dad joined in and although we did have a few odd looks from other people in the park, our children were eating one of their five a day without even realising it. We decided to make our trip to the park that little bit more exciting by adding an element of Disney fun to our trip. One of our favourite Disney films is Dumbo so we decided to take a leaf (or should that be feather??) out of his book and have the courage to fly through the sky ourselves using Monkey bars, Fireman's poles and Swings. Playing in the park was suddenly so much more fun when we discovered we could fly! We have all thoroughly enjoyed joining in with #HealthilyEverAfter and it is something that we are keen to carry on throughout the year. A few simple ideas using characters our children already adore can really make a difference in encouraging us all to lead a healthier lifestyle. Visit www.DisneyHealthyLiving.co.uk for further inspiration. You'll find lots of ideas ranging from Olaf-themed Bento boxes to a Bare Necessities juice recipe and instructions on how to play Rapunzel's Frying Pan Tennis. How do you encourage your family to be healthier and more active? Such a good idea. I feel that the world we live in is filled with quick easy and not always healthy options but from a young age its important for them to be getting their fruit and veg! Was a lovely read, we as kids were always fuelled on lots of vegetables and my mam was always trying more to get us to eat more fruit too. What a brilliant idea! I love Disney and I'm hoping my girls will too. I am already subconciously doing this by telling my toddler "this is special Elsa donner" when she won't eat. Come to think of it I have never seen Disney characters as health advocates but you are so right! They really do promote healthy living! A great idea to help kids to eat more healthily. I try and lead by example in our family, as I know there are always little eyes watching! Characters influence the children a lot. Great idea. Disney for the win!!! Those are great sounding ideas and can see how it's hard to not want to take part in an healthy lifestyle with those tips. I love disney movies and a story where there is always a moral. It feels like I didn't waste time watching it. Great post! I think it is so great that Disney are doing this. They are so hugely influential when it comes to kids, so it's good that they are putting that to good use. I could totally work this on my daughter, she would love to do what you have been doing. 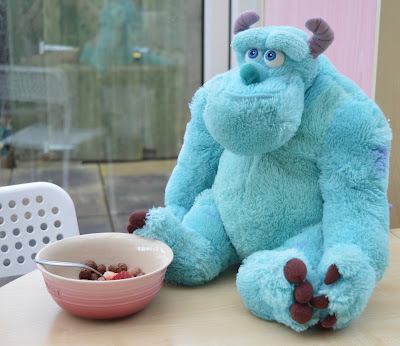 I love Monsters Inc. - what a great toy! This is such a great idea. I'd never of thought of this. I like turning exercise into a game, so my brother doesn't even know he's doing it. Football is great. Loving the inspiration. Commenting for myself and on behalf of BritMums and thanking you for taking part.